Holiday Weekend Event Planner - Eat. Drink. Buy Art on Delmarva. The holiday season is a great time to get away to discover our small towns and there are plenty of weekend events to take in while you are here. 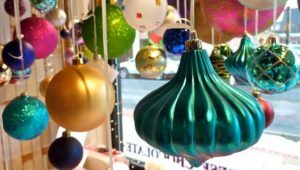 There are many unique events that celebrate the season and offer opportunities to experience local food and drink, shop for specialty items, explore the work of local artists and take in a festive performance. Here is a weekend planner to help you plan your holiday trip to Delmarva. Skip the mall crowds and shop locally on Maryland’s Eastern Shore with a visit to Caroline County’s towns, Cambridge or a little further down Route 50 to Berlin. Find unique, handmade gifts for your holiday giving and support small businesses during Created in Caroline where studios and galleries will be open all weekend. You can Shop, Dine and Win when you support downtown businesses in Cambridge. Spend $20 or more at participating retailers or $50 or more at participating restaurants and get entered to win prizes. While you are in that area, stop by The Dorchester County Arts Council. For eclectic holiday show and sale featuring the work of over thirty local and regional artists in a variety of mediums. Handcrafted gold and silver jewelry, fiber art, fused glass, sculpture, paintings and photography – truly unique items for inspired gift giving! Locals and visitors shake off their turkey induced comas and head out to downtown Berlin on Friday after Thanksgiving. The town lights up for the holidays with a celebration and boutiques, galleries and shops stay open to help you get an early jump on that shopping list. Enjoy a local craft brew or enjoy dinner at one of the town’s fantastic restaurants. The Worcester County Arts Council (WCAC) kicks off its Holly – Days Art Exhibit and Sale during Berlin’s Open House. Find beautiful paintings, photography, ceramic and glass sculptures, silk painted scarves, handcrafted jewelry, cards and more are available at very reasonable prices for all your holiday gift giving needs. The holidays are sweet in Milford, DE with the Downtown Dessert Tour on Saturday, 12/1. Milford is home to Southern Delaware’s most creative and diverse bakeries and they collaborated to bring a sweet adventure to downtown Milford. Blending a jolly treasure hunt, festive foods, and an amble through quaint streets, the Downtown Dessert Tour will make spirits merry and bright at the start of the holiday season. Tour and snack at your own pace and submit your stamped tour map to win delicious prizes. 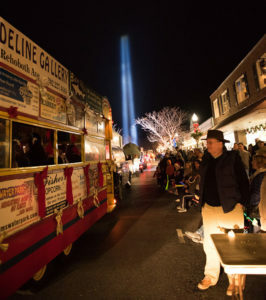 After you get your dessert fix, head over to nearby Lewes for a historic holiday weekend celebration with an Old Fashioned Christmas parade, tree lighting and candlelight caroling. Lewes is home to world-class restaurants and plenty of shops stocked clothes, home decor, toys and art. Come out and celebrate the tree lighting at Winter Wonderland 2018 in the Salisbury City Park at 5pm on 11/24 featuring live performances by Feet of Fire dance studio, AMP music studio, and Beauty for Ashes. Mayor Jake Day will share a classic Christmas tale. Santa Clause will arrive just in time to help us countdown and then stay for free pictures! While you are in town, take in the 28th Annual Nutcracker Ballet presented by Eastern Shore Ballet Theatre. A celebration of Charles Dickens’ classic story, “A Christmas Carol” will transform the downtown Snow Hill into Victorian London on Saturday and Sunday! Appearances by the characters, roasted chestnuts, carriage rides and demonstrations will take you back in time! Join the fun and wear a costume. Make this the weekend to finish your Christmas shopping list and have some small town cheer. Spend Friday of the weekend in Seaford, DE at Gallery 107 for a Holiday Open House. Enjoy some holiday cheer and friendship and maybe even find a giftie or two for that special loved one! Refreshments served. Or kickoff your weekend with a Holiday Art Stroll in Milford, DE and check out costumed strolling holiday carolers, live holiday music, the Delmarva Miniature Horse Club, alpacas, carriage rides provided by Indian Branch Drafts, decorated business windows, and of course, a visit to Santa’s House. 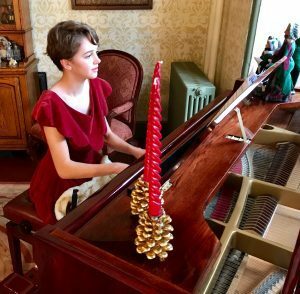 Traditional entertainment is one of the highlights of the Holiday Stroll; everything from barbershop quartets, bands, young carolers, faculty /student performances at the Music School of Delaware, and dance performances by the First State Dance Academy. The second annual “Dickens of a Christmas” celebration will bring London-themed holiday fun, food and drink back to downtown Chestertown with special musical guests The American Rogues. This special weekend will host a holiday house tour, strolling entertainer Jerry Brown and his monkey Django, the Pyroxotic fire dancing troupe (this year with fire eaters and breathers), old-fashioned children’s games, musical acts, the Wheelmen antique bicycle club, horse-drawn carriage rides, Stories and Songs by the Fire, High Tea, street theater, a London Row of vendors selling handcrafted goods and traditional British foods, and a “Run Like the Dickens” 5K race. horse drawn carriage rides, pop up carolers, holiday shopping, a visit with Santa! Special receptions hosted at downtown businesses and art galleries! Come enjoy holiday shopping and the spirit of the holidays again by taking a stroll through our historic downtown. Come to Snow Hill for an art filled weekend! First Friday, Arts on the River Gallery Walk located in Downtown will feature various artists in multiple locations. The Rotary Club of Snow Hill will also be holding their annual Christmas Market on Saturday in the Old Firehouse on W. Green Street from 12pm-8pm. There will be quilted handbags, nature inspired jewelry, alpaca products, cutting boards, scarves, coffee, breads, and more! Come do your Christmas shopping! Enjoy an Old-Fashioned Christmas at Blue Dog Café with a gourmet dinner along with exceptional holiday performances. Ever seen a crab pot Christmas tree? Well you can if you spend this weekend in downtown Crisfield. The tree lighting takes place on December 7th and on December 8th, celebrate A Miracle on 10th Street with pictures with Santa in Santa’s Village, train rides, face painting, a Christmas decorating contest, live entertainment, food vendors, and Christmas shopping with locally made arts and crafts. Plan a beach getaway to calm those holiday nerves. Kick off the weekend before the last weekend before Christmas with The Nutcracker at the Ocean City Performing Arts Center on 12/16. Then head north for a Weekend Wonderland in Bethany Beach and take advantage of tax-free holiday shopping, carriage rides, photos with Santa, caroling around the tree and more. Wishing you a happy holiday season from all of us at Eat. Drink. Buy Art!